Singer's Annuity and Funds Report has been revamped, expanded, and made interactive! It will still be sent to readers six times a year, however -- once for each quarter, plus the half year and end of year summary. Now, subscribers to the Singer's Annuity and Funds Report will receive actual bank data for all 3,600 operating banks and 700 bank holding companies—not just the top 50 or so in each category. In addition, readers will still receive a PDF attachment featuring the top 100 in four key categories. Earlier, this spreadsheet data was only available Singer’s data subscribers — at a cost $2,900 a year. This new interactive format will cost subscribers just $595 a year. An Excel spreadsheet for 3,600-plus operating banks (annuity revenues, securities brokerage, trust revenues, insurance brokerage revenues, assets, deposits, noninterest income, and more). 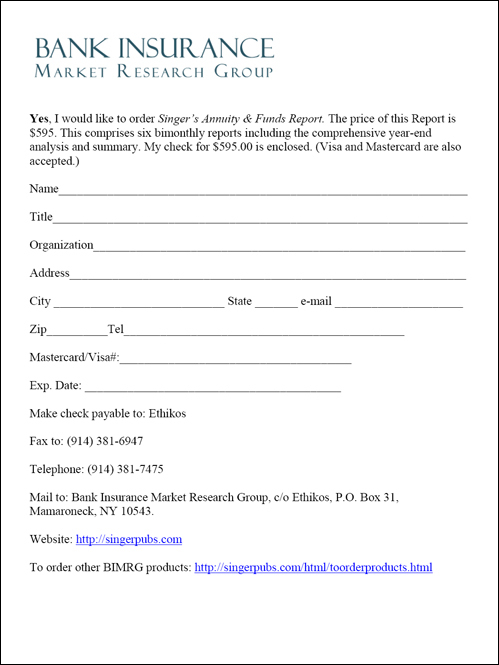 The new Singer's Annuity and Funds report is paperless and available for immediate electronic delivery.